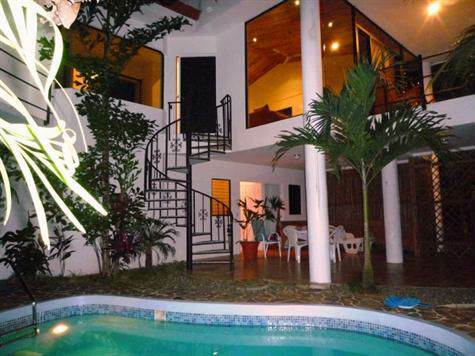 Casa Loma is located in the heart of Manuel Antonio. Within walking distance of the main road, hotels, shops, restaurants and schools this is an excellent location to live the laid back beach town lifestyle. It measures approximately 1400 square feet and is divided into 2 bedrooms and 2 bathrooms, a living room, an open kitchen with a small terrace off the living room. A pool and a beautiful garden are features of the private grounds. There is a laundry and storage room on the first level along with parking space for two cars. With an asking price is $ 339,000, If we consider the privacy, security, quality of construction and location, this would be one of the best deals of Ml Antonio.